What makes collaboration meaningful and productive? There are many essential aspects to successful collaborations, such as open communications and having shared goals. But there’s one factor that characterises the very best; that’s when we share the most precious asset of all – our knowledge. Knowledge sharing within an organisation is normal. But sharing externally is something we are less used to doing. Knowledge is a vital part of our competitive advantage. Often, it’s something that we trade. Even when knowledge is not commercially sensitive the culture or process that encourages dissemination to external organisations isn’t well developed. But keeping knowledge to ourselves doesn’t help us deliver the best outcomes for our customers, road users or the economy. To work smarter we have to get better at sharing what we know and what we learn. A vital aspect of the integrator role in frameworks should be as an enabler for knowledge sharing across all partners. Partly, this means providing a structure; more importantly, it means engendering a culture in which designers, consultants and supply chains can work with customer and contractor teams to maximise capacity and implement better solutions. Sharing knowledge across multiple organisations isn’t an easy thing to do, culturally or logistically. Our STOP Think! programme, and the collaborative safety culture we are building around it shows what’s possible. It matters to us that all of our people and those working in our supply chain go home safe and unharmed at the end of every shift. If by sharing what we know more widely, we help one of our competitor’s operatives avoid injury (or worse) that too is a major win. 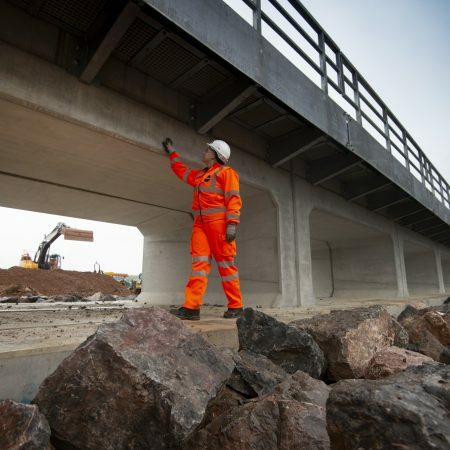 A growing culture of collaboration and knowledge sharing is one of the main reasons that our infrastructure frameworks have been able to deliver cost savings, quality improvements and a step change in safety performance. The One Team Wessex rail framework is becoming an exemplar of how pooled expertise can help everyone win. In a highly competitive environment, where contractors and supply chains survive on thin margins, it would be wrong to assume that sharing knowledge is easy, or can just be willed into place. It has to be planned, measured and enforced through culture and behaviours. While it’s not easy, we’re also convinced that it’s indispensable if the Road Investment Strategy is to deliver the change in performance we need, and for road users to notice the difference.